In order to survive in worldwide competition, firms must optimise their production processes. Necessary for this are not only networked digitisation and a comprehensive information and telecommunications (ITC) infrastructure, but also intelligent robot solutions. Regardless of which slogan one uses, be it Industry 4.0, Internet of Things, or Digitisation and Big Data, the fundamental aim is to make production in the firms more flexible, faster and fit for the future. What help is available for setting up an optimised production is shown at many exhibitors at Automatica. For the challenges of the future, firms must go beyond the limits of previous automation solutions. For artificial intelligence, networking and Deep Learning will shape the industrial environment of the future. One conclusion is obvious: the rapid growth of flexible, sensitive and networked production systems can only be successful if these systems become easy to operate for an ever greater number of people. For this reason, Kuka, with the robot “LBR iiwa”, intended to help with work on the assembly line, was the first robot manufacturer worldwide to lay the foundation stone for sensitive and safe cooperation between man and machine. In the man/robot collaboration (MRC) of the future, the robot will no longer simply assist in the industrial environment, but will develop into an everyday companion of the human being. To achieve this, all interfaces must be simplified – whether for programming, commissioning, operation, analysis or service. At Automatica, Kuka will be showing solutions covering not only the role of the cobot in the industrial environment, but also going beyond the industrial environment. How can Big Data help to make an existing production more effective? And how can an entire network of partners catapult even small firms into advanced technology? 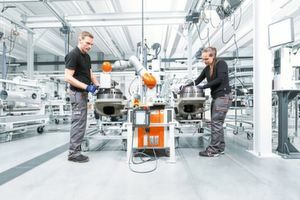 The latest version of the Kuka slogan, “industrial intelligence 4.0_beyond automation”, is meant to reflect how much is possible in the interplay of the topics cobots, intelligent machines, logistics, Cloud and connectivity. 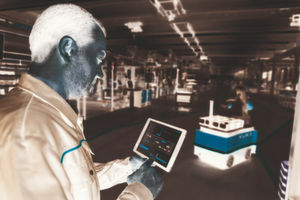 From direct cooperation between man and machine to preconfigured application packets, and going on to mobile robot and logistics solutions: Kuka intends to demonstrate in the smart factory at Booth 221 in Hall A4 at Automatica the interplay of a large number of industrial robots and automation solutions. The firm was founded 120 years ago. For visitors to Automatica there will therefore be a surprise which looks towards the production of individual products.